How can I find a rehabber, raptor center, state wildlife agency, or USFWS regional office for my state? DNR Offices and Officers in each state. We do our best to keep this page updated. If you come across an inactive link or outdated information, or if would like us to add your Raptor Center to the table, please let us know by emailing our webmaster, Carolyn Stalcup. Page last updated November 9, 2018. If you have found an injured Eagle, Hawk, Owl, Vulture, or other raptor, AWC will try to help you get the bird to our rehabilitation clinic at Oak Mountain State Park in Pelham (just south of Birmingham). If you are closer to Opelika, we will try to help you get the bird to the Southeastern Raptor Center at the Auburn School of Veterinary Medicine. The center makes presentations to more than 30,000 people throughout the southeastern U.S each year. The center also rehabilitates hundreds of injured, ill or orphaned raptors annually. JRC provides medical care to over 150 sick and injured raptors and other birds each year. JRC also delivers educational programs, featuring non-releasable birds, to local and regional groups, teaching audiences of all ages the basics of conservation. For injured raptor emergencies (live person 24 hours), call 480-595-5047. For non-emergencies, call between 10am and 4pm. Wild At Heart operates 24 hours a day, seven days a week. We recognize that injuries and mishaps can happen on any day and at any time for these birds. It is our mission to be available in person when the birds need assistance.The Wild At Heart organization is coordinated and managed by a core group of remarkably dedicated and energetic individuals. Our facilities include 51 outdoor aviaries, and an on-site, indoor critical-care room for any raptors needing short-term, or ongoing medical treatment. Raptor Ranch is a wildlife education facility, bird of prey breeding project, and home of the Northern Arizona Raptor Foundation. Our mission is to provide the public with an understanding of raptors, falconry, and wildlife conservation through unique educational displays and demonstrations. Adobe Mountain Wildlife Center receives hundreds of animals annually. Thanks to the dedication of our volunteers and the support of the public, we successfully return 70% back into the wild. The Center operates on a limited budget from the Heritage Fund and private donations. At Raptor Rehab of Central Arkansas our mission is to provide quality care and rehabilitation for ill, injured or orphaned birds of prey with the goal of their release back into the wild. US Fish & Wildlife Service Rehabilitation; US Fish & Wildlife (Special purpose possession) Arkansas Wildlife Rehabilitation; Morning Star is especially interested in native Arkansas species, including raptors, mammals, reptiles, and amphibians. Rehabilitation office – 530-7520-6091; Education office – 530-752-9994. The California Raptor Center (CRC) is dedicated to the rehabilitation of injured and orphaned raptors. The Raptor Center and the Veterinary Medical Teaching Hospital (VMTH) together receive about 300-350 injured or ill raptors each year from concerned people in the community who care enough to take action when they encounter an injured bird. Many of the raptors treated are admitted due to adverse contact with human activity. Through care and rehabilitation about 60% of these birds are released. The Ojai Raptor Center (ORC) is a state and federally licensed 501(c) (3) nonprofit organization dedicated to the rescue, rehabilitation and release of birds of prey and other wildlife, and to providing educational programs about wildlife and our shared environment. For 33 years, Rocky Mountain Raptor Program has served the northern Colorado community through rescue, rehabilitation & release of injured birds of prey. Our community-based team of veterinary experts and specially trained volunteers provides all aspects of raptor care ranging from compassionate medical care to constructing cages that serve as temporary homes for recovering birds. The Birds of Prey Foundation is a 501(c)(3) nonprofit organization dedicated to the rehabilitation and release of injured and orphaned raptors. Each year over 500 birds arrive for care from all over Colorado and other states. Horizon Wings is a non-profit Wildlife Rehabilitation Center specializing in Birds of Prey. All of their funding is provided by educational programs and donations. The mission of Tri-State Bird Rescue & Research is to achieve excellence in the rehabilitation of injured, orphaned, and oiled native wild birds, with the goal of returning healthy birds to their natural environment. We do this through compassionate care, humane research, and education. In response to community need, Tri-State Bird Rescue opened a full-time Wild Bird Clinic in 1982 to care for ill, injured, and orphaned wild birds. We outgrew the original facility because of a rapidly growing caseload and with the help of the community, Tri-State opened a new state-of-the-art wildlife facility in 1989. Today the Frink Center for Wildlife consists of animal care wards, surgery and research labs, outdoor aviaries and pools, an oil spill facility, and administrative offices. This urban environmental Audubon Center focuses on the rescue, medical treatment, rehabilitation and release of Florida’s raptors. Rehabilitation, Education, Falconry Caring for injured and orphaned birds of prey is at the core of what we do. Our education programs are designed to encourage interest and concern for Florida’s native birds of prey. Falconry training allows us to better assess a bird’s ability to survive in the wild. For more than four decades, CROW has provided compassionate care to animals at all stages of illness and injury. Whether providing for an orphaned baby rabbit or rehabilitating an injured raccoon and releasing it back into the wild, our staff and volunteers are making a difference and our 4,800-square-foot wildlife hospital is where it all takes place. CROW also treats and rehabilitates raptors. Peace River Wildlife Center is a member of the Florida Wildlife Rehabilitation Association (FWRA), the National Wildlife Rehabilitation Association, and the International Wildlife Rehabilitation Council. We are licensed and overseen and licensed by the US FWC, USDA, and FL FWC. Open 8:00 a.m. – 5:00 pm daily for injured animal intake. The mission of the Peace River Wildlife Center is to treat and rehabilitate injured and orphaned native Florida wildlife (except venomous snakes) and, if possible, to return them to the wild. If they cannot be returned to their natural habitat due to sustained non life-threatening physical limitations, a permanent home shall be provided by the Center. We also seek to inform the public about native Florida wildlife and how to co-exist with these beautiful creatures successfully through formal educational outreach activities. Our mission is protecting Southwest Florida’s unique and natural environment, now and forever. We work to protect land, water, and wildlife, encourage planned growth and educate the public on Southwest Florida environment. The Conservancy works to protect and rehabilitate many of the 100 threatened or listed species in Florida in a variety of ways. Our scientists conduct regular research on wildlife and their habitats. The von Arx Wildlife Hospital at the Conservancy of Southwest Florida treats over 3,000 of injured, orphaned or sick native animals on an annual basis. We are a non-profit organization based in Pensacola, Florida, that works to provide appropriate care to injured or orphaned indigenous wildlife. We receive injured or orphaned wildlife, provide medical care and fostering during recovery, and rehabilitate and release wildlife, if possible. We work in cooperation with local, state, and federal wildlife agencies. We also provide educational outreach and conduct educational programs. All of our birds are unable to be released into the wild due to injuries or behavioral handicaps. The Center for Wildlife Education and The Lamar Q Ball, Jr. Raptor Center strives to provide quality environmental education for visitors of all ages. The Center exists to support Georgia Southern University in its environmental education programs, as well as to provide wildlife encounters for the school children and citizens of this region. Hawaii’s only state-of-the art response, rehabilitation, research and education organization exclusively for and about native wildlife. The Peregrine Fund is a 501(c)3 non-profit organization dedicated to saving birds of prey from extinction. One of the primary missions of the World Center for Birds of Prey is the propagation of critically endangered species. Due to the necessity of maintaining a disease-free environment for these raptors, we cannot bring wild birds into our facilities. Therefore, we generally are not able to be involved in the rehabilitation of injured wild raptors. The Raptor Research Center (RRC) operates in the College of Arts and Sciences at Boise State University. The RRC and the Dept. of Biological Sciences share common interests in basic biology and the conservation of natural resources. The center and department collaborate to pursue these interests through research, education, and conservation, especially regarding raptors (birds of prey) and their ecosystems. Although we specialize in birds of prey (hawks, owls and eagles) as wildlife rehabilitators, we attempt to provide care for any injured or orphaned wild animals. The Purpose of the Illinois Raptor Center is the rehabilitation of orphaned and injured wildlife for their return to the wild; the extension of wildlife and environmental education; to protect threatened and endangered species through education and rehabilitation; to promote humane and responsible treatment of animals; all within the guidelines of local, state and federal laws and regulations. The Raptor Rehabilitation Center located in Quincy, Illinois, is dedicated to the recovery and preservation of Birds of Prey and other wild animals. SOAR only accepts birds of prey. ~to EDUCATE the public on the importance of raptors and habitat; ~to PROMOTE the scientific study of free-living raptors; ~to TRAIN raptor handlers, and help improve conditions for all raptors in captivity; ~to REHABILITATE ill, injured, and orphaned raptors and return them to the wild; ~to help RESOLVE human/raptor conflicts. Indiana Raptor Center is a 501(c)(3) non-profit organization dedicated to the rescue of injured or orphaned wild birds, their rehabilitation and their return to the wild. Our mission is comprised of a triad of objectives, none of which may be effectively achieved without the others: Rehabilitation, Education, and Conservation. Based in Allen County, Indiana, Soarin’ Hawk is dedicated to the rescue, recovery and release of injured and orphaned birds of prey. We are an organization for anyone interested in conservation of birds of prey, whether it be through rehabilitation, education or preservation of habitat. Saving Our Avian Resources (SOAR) is a 501(c)(3) organization established in 1999 dedicated to saving our avian resources through raptor rehabilitation, education, and research. SOAR maintains all necessary US Fish & Wildlife Service and Iowa DNR permits to provide the rehabilitation and education. Eagle Valley Raptor Center specializes in native Kansas Birds of Prey. These include Eagles, Hawks, Owls, Kites, Falcons and Vultures. It is our great pleasure to help these animals become independent again and return back to their natural way of life. We are an all volunteer group dedicated to the rehabilitation of sick, injured and orphaned birds of prey. We rely solely on the dedication of volunteers and the generosity of our supporters. We take in between 250-300 sick, injured and orphaned raptors every year, and release over 60% back into the wild. Dedicated to conservation of birds of prey through public education. Rehabilitation of injured or orphaned raptors. Reconditioning and release of raptors utilizing falconry techniques. Heckhaven Wildlife Rehabilitation Center is a non-profit 501c, animal welfare organization, with federal and state rehabilitation permits. Our sole purpose is to care for, rehabilitate and release back into their natural environment any and all wild born creatures that find themselves in the hands of man. We take in over one thousand injured or orphaned wild animals and raptors per year, including deer, pelicans, eagles, owls, ospreys, hawks, racoons, foxes, mink, opossum, nutria, squirrels and wild rabbits, most of which are brought to us by Animal Control Officers, Louisiana Wildlife and Fisheries Agents, and Louisiana Park Rangers. We provide care and medical treatment, and then release the animals back into the wild on protected reserves and refuges. We also take in and care for abandoned or abused exotic pets. Our mission is to carry out conservation medicine by providing veterinary care for injured wildlife, conduct conservation research, and educate the public about wildlife conservation in the state of Louisiana. The Center for Wildlife is a private, non-profit organization with a mission to build a sustainable future for wildlife in our community through our medical treatment, rehabilitation, educational outreach, research, and conservation activities. Our clinic treats an average of 1,600 injured and orphaned wild animals, and our education team presents programming to 7,500 participants annually. Our annual case load has increased from about 300 to about 1,500, making us one of the largest rehabilitation practices in New England. All told to date, nearly 12,000 birds from more than 100 species have been treated at Avian Haven. We accept birds of all species from the general public, and via referrals from veterinarians, Maine Wildlife Biologists, Maine Game Wardens, Animal Control Officers, and other Maine rehabilitators. We are not a nature center or a zoo; all of our birds are being prepared for release to the wild and thus are required by our permit conditions to have minimal contact with humans. Acadia Wildlife Foundation is a non-profit wildlife rehabiitation clinic and Nature Center located in Bar Harbor, Maine. Acadia Wildlife Foundation was founded in 1994 with the goal of caring for injured or orphaned native animals and releasing them back to the wild. The care of wildlife, or wildlife rehabilitation, is done here by trained professionals with licenses from the state of Maine, and the federal government. Animals are brought to our clinic by game wardens, vets, police, marine patrol, and by many members of the general public from three counties of central, coastal Maine. Founded in 2002, Owl Moon Raptor Center is a state and federally licensed wildlife rehabilitation center specializing in birds of prey. We have been a licensed non-profit organization since 2014. Owl Moon cooperates with the Maryland Department of Natural Resources, Wildlife & Heritage Service, and local animal control offices and humane societies to answer calls concerning injured, orphaned, or otherwise jeopardized birds of prey. Owl Moon rescues, rehabilitates, and reconditions raptors with the goal of returning them to the wild. Julie Anne Collier and Jim Parks are both licensed raptor rehabilitators based in Massachusetts. Together they care for injured birds of prey. Most of the birds they rehabilitate can ultimately be released back into the wild, but in some cases the birds are left permanently handicapped. Julie and Jim are further licensed to provide a home for these nonreleasable raptors, and to use them for educational programs. Since 1994 WINGMASTERS has presented thousands of programs at schools, libraries and museums throughout New England. Julie Anne Collier and Jim Parks are both licensed raptor rehabilitators based in Massachusetts. Together they care for injured birds of prey. Most of the birds they rehabilitate can ultimately be released back into the wild, but in some cases the birds are left permanently handicapped. Julie and Jim are further licensed to provide a home for these non-releasable raptors, and to use them for educational programs. Since 1994 WINGMASTERS has presented over 5000 programs at schools, libraries and museums throughout New England. The purpose of the Center is to rehabilitate sick, injured and/or orphaned raptors and return them to the wild in a healthy and fit condition. Educating the public (particularly school-age children) about wildlife conservation, ecology, and habitat preservation is a primary goal. The Center also hopes to increase the overall knowledge of rehabilitation methods through fieldwork, scientific research, and networking with others in the field. We are a 501 (c)(3) non-profit organization. Wings of Wonder is licensed by the Michigan Department of Natural Resources and the US Fish and Wildlife Service to admit injured, sick and orphaned raptors. These birds come from a variety of sources: DNR, local veterinary clinic referrals, 911 calls, the National Park Service, and folks who have found injured birds. Our primary goal is to release healthy and fully conditioned raptors back into the wild. The center currently has 9 area veterinary hospitals providing medical services and resources when needed in the treatment of injured raptors. These resources include radiology, surgery, euthanasia, medications, laboratory tests, orthopedics, etc. Most raptors admitted to Wings of Wonder are seen by a tending veterinarian within 48 hours of their arrival. All pre and post intensive rehabilitation work is done on site in the Wings of Wonder hospital. As raptor patients become healthier and stronger they are moved outdoors into our conditioning and pre-release flight enclosures. The enclosures vary in size and include the smallest at 8 ft x 10 ft. all the way up to our largest which is 100 ft x 16 ft. Currently Wings of Wonder is one of only three facilities in the state of Michigan with a 100 foot or larger flight training/conditioning enclosure. The aviary is big enough to aerobically condition large bald eagles and turkey vultures prior to their release. Established in 1974 as part of the University of Minnesota College of Veterinary Medicine, The Raptor Center rehabilitates more than 700 sick and injured raptors each year, while helping to identify emerging environmental issues related to raptor health and populations. An internationally renowned education facility, The Raptor Center trains veterinary students and veterinarians from around the world to become future leaders in raptor medicine and conservation. In addition, The Raptor Center reaches more than 200,000 people annually through its unique public education programs and events. There are no raptor centers in Mississippi at this time. WRANPS Wildlife Center (Pass Christian) was wiped out by Hurricane Katrina and has not reopened. Southeast Region – (Region 4). The World Bird Sanctuary’s mission is to preserve the earth’s biological diversity and to secure the future of threatened bird species in their natural environments. We work to fulfill that mission through education, captive breeding, field studies and rehabilitation. Goals: To rehabilitate and release birds of prey back into the wild; to educate the public about raptors & their importance in our environment; to gain more information about raptors. The Raptor Rehabilitation Project is a service and education organization of the University of Missouri-College of Veterinary Medicine in Columbia, Missouri. Veterinary students, community members and other University of Missouri students volunteer their time and effort in rehabilitating injured raptors and caring for resident birds. Volunteers also help raise public awareness by giving presentations throughout central Missouri. We bring education birds on these presentations to teach people about the ecological and cultural importance of birds of prey. Saving Raptors since 1988. Our mission is to improve the welfare of raptors across Montana through rehabilitation of injured birds, community education, and partnerships for raptor conservation and research. To provide a lifetime of quality care to permanently disabled birds of prey; to educate schools and the public through the use of live birds such as eagles, hawks, falcons and owls in raptor education and wildlife art programs; to instill a sense of respect and admiration for these skilled hunters and to promote wildlife conservation and habitat preservation for our wild bird populations. Not open to the public. Raptor View Research Institute, Inc. is a 501(c)3 non-profit research and education organization established in 2004 and based in Missoula, Montana. Executive Director, Rob Domenech, has been researching and monitoring raptors in Western Montana since 1993. The mission of RVRI is to provide knowledge of raptors (birds of prey) and the ecosystems that support them to the public and scientific community, through research conservation and education. Fontenelle Forest’s Raptor Recovery (FFRR) is part of Fontenelle Forest. They are the only group in the State of Nebraska permitted by the state and federal government to rehabilitate orphaned or injured raptors. They provide care and support for injured and orphaned raptors in preparation for release; they assist in the management of raptor populations and raptor research; and generate public support for raptor conservation through educational programs, displays, and special events utilizing live (non-releasable) raptors as ambassadors for their kind. Each year FFRR receives hundreds of injured, sick, poisoned, or orphaned birds of prey. The birds receive medical care while minimizing human contact. Once restored to health, they are banded and released. Get up close and personal as awe-inspiring hawks, falcons and owls demonstrate the amazing skills of raptors in this fascinating, entertaining and educational presentation by falconers Jim and Kathleen Tigan. This is primarily an educational / entertaining organization. This Federally licensed falconry school is available for demonstrations and/or classes. Choose a falconry experience that meets your level of expectations and desires, from an educational program geared to all ages to actually flying a bird or to following a real hunt in which a raptor and a pointing dog work as a team with a master falconer. The Raptor Trust is one of the premier wild bird rehabilitation centers in the United States. Located in central New Jersey, the Trust includes a hospital with state-of-the-art medical facilities, quality exterior housing for several hundred birds, and an education building. A stalwart advocate for birds of prey for three decades, it is now recognized as a national leader in the fields of raptor conservation and avian rehabilitation.The Raptor Trust is open to the public seven days a week. The mission of The Santa Fe Raptor Center is to care for injured birds in order to release them back into their natural habitat through rescue, rehabilitation, and release. Hundreds of injured and orphaned birds are found by caring individuals each year in New Mexico. Common causes of trauma are impact with power lines and vehicles, and poisoning by pest control products and lead gunshot. If you find a wild bird that needs help please call us at 699-0455 or 662-7418. We can advise you on what to do and will arrange to get the bird to our facility. Santa Fe Raptor Center is a registered nonprofit 501 (c)(3) organization. Mission statement: to raise, rehabilitate, release and educate. The Delaware Valley Raptor Center, located in Milford, PA, is a private, not-for-profit, tax-exempt state and federally licensed rehabilitation organization dedicated to the rehabilitation and conservation of birds of prey (hawks, eagles, owls, falcons, and vultures). Our goals are to provide humane professional care for orphaned, ill, and injured raptors so they can ultimately be returned to the wild, healthy and no longer dependent upon humans for survival. We also strive to foster a greater appreciation and respect for all wildlife through public education programs and the publication of the DVRC Journal. Adirondack Raptors is a privately owned business that monitors and studies local raptor populations. The goal is to educate the public about these incredible creatures. Mark Manske established Adirondack Raptor Inc. in 2008. He was a public school educator for 27 years, an Adjunct Professor at Paul Smiths College from 2007 to 2012, a wildlife rehabilitator from 1994 through 2002, a master falconer since 2003, a master raptor bander since 1988, and a licensed nuisance wildlife control agent from 2008 through 2012. He has published several articles on birds of prey in scientific journals through the years. To report an injured raptor or speak with someone in our hospital, call 704-875-6521 x 111. Hospital hours are 7:30 am to 7 pm. To report an injured raptor or speak with someone in our hospital, call 704-875-6521 x 111. Carolina Raptor Center is dedicated to environmental stewardship and the conservation of birds of prey, through education, research, and the rehabilitation of injured and orphaned raptors. The mission of Cape Fear Raptor Center is to provide compassionate and aggressive rehabilitation services to injured raptors with the goal of release back to their natural habitat. Furthermore, we provide education to citizens of North Carolina and the Southeastern region on the importance that raptors serve in our ecosystem in order to help ensure the presence ofr raptors in our environment for generations to come. The Dakota Zoo conducts medical treatment and rehabilitation for numerous raptors each year, specializing in endangered and threatened species, particularly eagles. By federal law, all raptors are the property of the US Fish & Wildlife Service, and the Dakota Zoo assists with veterinary care and rehabilitation on a permitted basis. Information on birds that have been shot is relayed to the U.S. Fish & Wildlife Service for investigation and prosecution. While we enjoy having raptors on exhibit and being able to educate Zoo visitors about them, it is a far better feeling when we are able to rehabilitate and return a recovered bird back into the wild. The Medina Raptor Center is a state and federally licensed facility dedicated to the rescue, rehabilitation and release of birds of prey. Our mission and focus also include educational outreach programs that utilize live birds of prey to educate children and adults about raptors and their role in the ecosystem, and the need to preserve habitat. It is a 501(c)(3) non profit organization. The purpose of the Raptor Center is to rehabilitate injured birds of prey, and to educate the public about raptors, other wildlife, and conservation issues. The Ohio Bird Sanctuary is a 501(3) non-profit organization dedicated to the rehabilitation of Ohio’s native birds of prey and songbirds, with an emphasis on educating the community about conservation of our natural resources. It is open to the public, with over 90 acres including hiking trails, live birds of prey display, and a walk-through songbird aviary. RAPTOR serves the greater Cincinnati area, rehabilitating injured birds of prey and providing education programs to the public on raptors and their contribution to the ecosystem. RAPTOR maintains a volunteer organization to support its activities including: coordination and pickup of injured raptors, rehabilitation and release of injured raptors, care and feeding of RAPTOR’s education birds, outreach educational programs, and maintenance and enhancement of RAPTOR’s facilities. The Oklahoma Raptor Center has worked since 1990 to raise, rehabilitate and release orphaned and injured wildlife. This includes most birds of prey, but not vultures. This organization directs Tulsa area people to their Avian veterinarian, and then the Raptor Center takes them for rehab and release. The Iowa Tribe has developed an eagle rehabilitation program in order to protect injured eagles and increase the community awareness of wildlife and Native American culture. The facility was first opened in January 2006 through funds provided by the U.S. Fish and Wildlife Services and the Iowa Tribe of Oklahoma. The Grey Snow Eagle House operates under several FWS permits. The Religious-Use Permit allows the Tribe to house eagles that are non-releasable due to the nature or severity of their injuries. This permit also allows the Tribe to gather naturally molted feathers and distribute them to Iowa tribal members and in future hopes to other tribes for use in ceremonies and cultural events. They are major players in the Oklahoma Eagle community. They are doing major eagle DNA research in coordination with Oklahoma State University. They have two 100ft cages of which one is a flight and they also have a 150ft Rehab cage that has a 45 degree bend at 100ft. The rehabilitation permit allows the Tribe to rehabilitate eagles from Oklahoma for their eventual release. The Eagle House has partnered with Oklahoma State University to conduct specific research pertaining to the long-term management of bald and golden eagles. This project will be rooted in the field of genetics and the findings will help to make sure the eagles are healthy not only at the ecosystem level, but also at the genetic levels. This will ensure that the species survives for many more years to come. The mission of Hawk Mountain Sanctuary Association is to conserve birds of prey worldwide by providing leadership in raptor conservation science and education, and by maintaining Hawk Mountain Sanctuary as a model observation, research and education facility. Since opening our doors in 1998, Born to Be Wild Nature Center has been dedicated to the rehabilitation of sick, injured and orphaned wild animals. Our goal in treating these animals is to return them to their natural habitats — giving them a second chance at life. Mission statement: To identify and address vital environmental issues by providing medical care to injured birds of prey and shorebirds, and through educational, research and conservation initiatives. “I have traveled worldwide and seen countless centers and this is the absolute best of its kind I have ever seen anywhere” – Jack Hanna The Center is open to the public Thursday through Saturday, 10 am to 5 pm year round. Guided tours are at 10:30 am and 2:00 pm. Black Hills Raptor Center provides 125-150 educational programs annually using live raptors. They present in classrooms, at youth programs, in the community, and for special events. Their long-term goals include a facility that can be visited by the public, and that can provide raptor rehabilitation services in western South Dakota. An all-volunteer group. 501(3)(3) status. 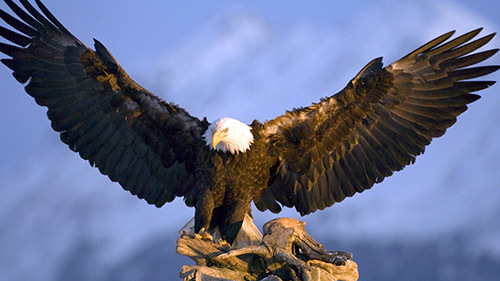 The American Eagle Foundation is dedicated to protect the majestic Bald Eagle and its habitat by supporting and conducting eagle and environmental recovery and education programs. We treat and rehabilitate raptors of all kinds, releasing those whose recovery is complete back into the wild. Our captive breeding program for non-releasable Bald and Golden Eagle pairs has resulted in the release of 150 young Bald Eagles from 1992 through 2016 from our Hack Tower on Douglas Lake in East Tennessee. Located at Dollywood, AEF’s Wings of America Birds of Prey show has been seen by millions of visitors. Bring an injured raptor to the Raptor Center as soon as possible. If you are unable to transport the bird yourself, call the center for pickup by a qualified center volunteer. The Mid-South Raptor Center is a 501(c)(3) Not-For-Profit Corporation. We are the only state-licensed raptor rehabilitation facility in West Tennessee. Your tax deductible donations go directly to the rehabilitation and treatment of injured and orphaned Tennessee birds of prey. Blackland Prairie Raptor Center is dedicated to environmental preservation through public education and the conservation of birds of prey and wildlife in their natural habitat. Blackland Prairie Raptor Center is a rehabilitation and conservation education organization, specializing in fostering better public understanding of the relationship between birds of prey and healthy ecosystems. A non-profit volunteer organization dedicated to Rehabilitation and release of injured, ill or orphaned native VA birds of prey (raptors); Education of the public about raptors and preservation of their habitat; and, Endeavoring to increase the wild population of endangered and threatened raptors. Our mission is to ensure the future of native wildlife through rescue and rehabilitation, research, and education. Not open to the public, but we are available to accept wildlife in need of help. Please call first. The Wildlife Center of Virginia provides quality health care, often on an emergency basis, to native wildlife. The Center operates out of a 5700 square-foot structure, which includes the veterinary clinic, diagnostics laboratory, operating suite, and radiology room, as well as offices for administration and outreach staff. The Center also has an array of outdoor facilities for non-releasable education animals as well as recovering patients, including large flight pens, a bear enclosure, an aviary, deer fawn pens, and more. The goal of the Center is “to treat to release” – to restore patients to health and return as many as possible to the wild. In rare instances, the Center has the opportunity to track eagles after their release. http://wildlifecenter.org/critter-corner/success-stories One of these eagles was ‘NX’ who had a massive following among eagle enthusiasts. Virginia is home to the several of our National Headquarters Offices. Sardis Raptor Center is the largest Bird of Prey Center in the Pacific Northwest and specializes in rehabilitating birds of prey. Thousands of hawks, owls, falcons, and eagles have been treated and released, soaring to freedom as a result of Sardis’ efforts.To help preserve our raptor populations, Sardis has been instrumental in providing education to the community. The center’s educational program is the permanent home to many different species of non-releasable hawks, owls, and eagles. Our mission is to rehabilitate and release injured and orphaned birds of prey and to provide environmental education programs to the public for the benefit of all living things. Our programs, which are adapted to all ages, are available to any group, organization or school simply by e-mailing or calling (304-366-2867). Veterinary & Rehabilitative Care: Emergency care, surgery, hospitalization and a full range of physical therapy treatments for non-game & endangered wild birds is provided by a coordinated network of 20 hospice veterinarians combined with a statewide support crew of volunteers and on-site staff. From hummingbirds to eagles, wading birds to soaring birds, TRAC cares for each species’ individual requirements; including diet, perching, water access, caging substrates, light levels, and behavioral needs. Once a farm for the Schlitz Brewery draft horses, Schlitz Audubon Nature Center is Milwaukee’s comprehensive nature center. Schlitz Audubon is a designated Important Bird Area because of the habitat provided by the lake for certain waterfowl. We are also a birding hot spot because of our location within a migratory flyway. Featuring live raptors, Schlitz Audubon Nature Center sets the scene for exciting discovery. Our feathered ambassadors can be your hosts in a variety of programs that are dedicated to providing an interactive, educational experience. This facility does not rehab birds, but they accept birds that cannot be released into the wild. These birds become ambassadors for their species and are used for educational purposes. Helping birds of prey through education, conservation, and rehabilitation. Rehabilitation of injured raptors is an important part of our mission. We have worked with 24 species of injured or sick raptors, brought to us from throughout the Greater Yellowstone Ecosystem. The most common raptors we work with are Great Horned Owls, followed closely by Red-tailed Hawks, Bald Eagles and American Kestrels. Regional USFWS Offices: Main Offices, Law Enforcement Offices, Migratory Bird Offices by State. Idaho, Oregon, Washington, Hawaii and the Pacific Islands. Colorado, Kansas, Montana, North Dakota, Nebraska, South Dakota, Utah and Wyoming.